The Copernicus Sentinel-3A satellite takes us over the Atlantic Ocean close to Spain and Portugal where the sky not only features clouds but also criss-cross tracks from maritime vessels. The familiar condensation trails – or contrails – we see in the sky usually come from aircraft, so it might seem strange that ships can also occasionally leave their mark in the sky. This rarely seen maritime twist on aircraft contrails was captured by Sentinel-3A on 16 January 2018. Known as ship tracks, these narrow cloud streaks form when water vapour condenses around small particles that ships emit in their exhaust fumes. They typically form when low-lying stratus and cumulus clouds are present and when the air surrounding the ship is calm. As the image shows, several shipping lanes intersect off the coast of Spain and Portugal. Although the Strait of Gibraltar is a busy shipping lane, with numerous ships travelling in and out of the Mediterranean Sea, there are no ship tracks visible here in the image. Most tracks are several hundreds of kilometres off shore. Like aircraft contrails, ship tracks may also play a role in our climate by reducing the amount of sunlight that reaches Earth's surface or conversely by trapping the Sun's radiation in our atmosphere – but this remains an uncertain aspect of climate science. 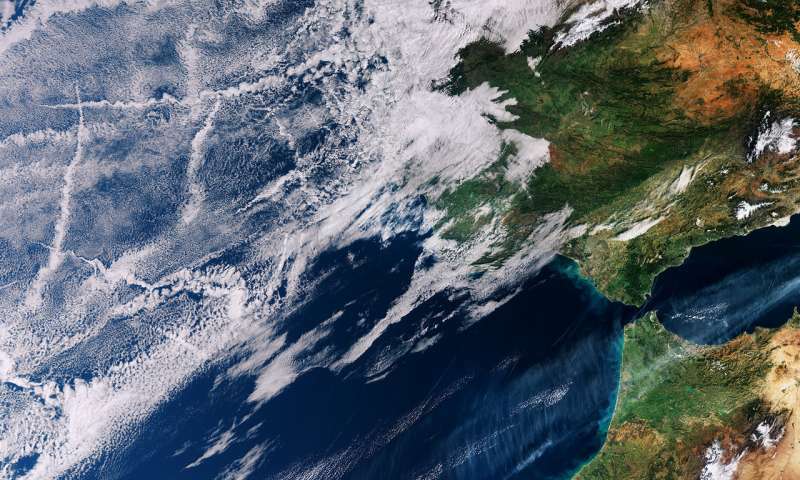 The Copernicus Sentinel-3A satellite carries a suite of sensors including an ocean and land colour instrument, which was used to capture this image.